A neck injury can significantly affect your health, finances and ability to enjoy life. If you are involved in an accident that causes harm to your neck, it is imperative to seek medical attention. As soon as you can, seeking legal assistance is the next step to take in your best interests. Having the right lawyers on your side can make all the difference in the outcome of your case. 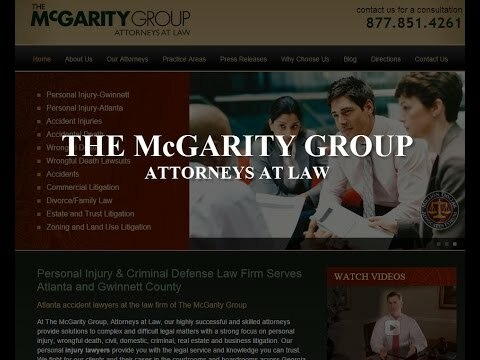 The personal injury attorneys at McGarity and Efstration, LLC have the experience and skills to help you receive compensation for your damages. Strain. A strained neck takes place when muscle fibers get torn, and this injury can range in severity. Common causes of neck strain are heavy weightlifting and whiplash. Spasm. Your neck muscles can seize up into a tight muscle contraction called a spasm. A spasm can be caused by being overly stressed, sitting at a desk for long periods of time or postural distortions. Massage techniques can help relieve spasms. Fracture. The bones in the neck are fragile. They can become broken when they are met with high-impact, as the result of a sports accident, an auto accident or from falling down. A fracture that is minor results in pain, slight paralysis and numbness. A serious neck fracture can lead to paralysis if spinal injuries occur as well. Stingers. An injury known as a stinger occurs when the neck is forced to excessively tilt or rotate an unnatural way. A burning, tingling sensation can be felt in the arms, shoulders and neck when you get this type of injury. Stingers are commonly caused by high-impact, as in a sports injury. Whiplash. Whiplash is a term used to describe neck pain following an injury to the soft tissues of the neck, such as muscles, ligaments and tendons. It is caused by an abnormal motion or force applied to the neck that result in movement beyond the neck’s normal range of motion. Some of the common symptoms of whiplash are pain, stiffness, headache, dizziness and pain in your back. Whiplash is commonly caused by auto accidents, falls, assaults and sporting activities. Herniated disc. A herniated disc occurs when one of the soft vertebral discs in the neck break open and extrude material into the spinal canal, which applies pressure on nerve roots and the spinal cord. The result is pain, numbness, tingling and muscle weakness in the neck, back, shoulders, arms and hands. Spinal dislocation. A dislocation occurs when your joints are forced out of their regular position. You can suffer a total or a partial dislocation. Most spinal dislocations are the result of traffic accidents, hard falls or high-impact sports injuries. Crushed vertebrae. A crushed vertebrae injury occurs when the bones of the spine become compressed due to a substantial trauma. Vertebral compression fractures can be caused by osteoporosis, trauma and diseases affecting bone. If you have suffered a personal injury that has caused harm to your neck, it is in your best interests to seek legal advice regarding your options for seeking monetary damages. The attorneys at McGarity and Efstration, LLC are prepared to take on your neck injury case. Call us today at 877.851.4261 or contact us online. Our two offices are conveniently located in Buford and Braselton, Georgia.